This WORSHIP QUOTE comes from Robert Webber, a theology professor at Wheaton College, in Wheaton, Illinois. "Worship celebrates God's saving deed in Jesus Christ. This kind of worship is not a goal-driven worship, but a Christ-driven worship. And when Christ is the center of worship, all the goals of worship are achieved: Christ-centered worship educates, evangelizes, heals, develops spirituality - and is most enjoyable. A Christ-centered worship - which is event-oriented worship - can never be static and merely intellectual because what happens is an actual and real communication of the power and benefit of the life, death, and resurrection of Christ. Worshiping churches recognize that every gathering of worship is ultimately a praise and thanksgiving for the overthrow of evil by God in Christ. This victory not only happened two thousand years ago, but it happens today in the lives of people who bring to worship their own struggles against that evil which shatters relationships, oppresses the poor, and brings constant dislocation into life. The event of Christ is the only event in human history that promises relocation and centering, meaning and purpose. This promise and its fulfillment evoke passionate and heartfelt praise and thanks, especially for those aware of their own brokenness and the healing which Christ brings into their lives." 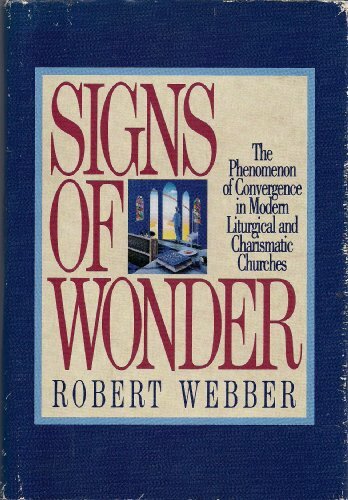 - Robert Webber, in SIGNS OF WONDER, Star Song, 1992. Lord, remind me that it is the risen Christ who is worthy of my worship and devotion. Forgive me for worshiping "worship." Forgive me for focusing so much energy on my successes or failures, my pleasures or pains. Give me devotion for you alone. Amen!